Losing your natural teeth results in a ton of problems. Of course you don’t look good – there’s nothing like missing teeth to cause you to look old before your time. Added to that, you could have trouble chewing – depending on the number of teeth you’ve lost, you might find chewing practically impossible. That brings us to another problem – you’re not enjoying steak, corn on the cob, apples, taffy, or any of the other foods that make life worth living…unless you have a blender. Most people seem to find that the blow to their self-esteem is the worst consequence of missing teeth. They don’t smile much, they avoid moving their mouths when they talk, and sometimes they avoid talking at all out of fear that they’ll forget and display a gap-toothed smile. 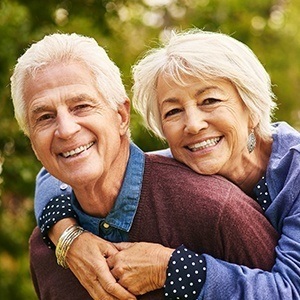 Why Choose Us for Dentures? With advancements in dentistry over the past number of decades, no one should have to live with an unsatisfactory smile, and no one should have to run a steak through a blender. There are a number of solutions. Dental implants are always the best alternative. If medical conditions preclude implants (they hardly ever do), partial or full dentures are the second-best solution. You probably know that dentures are just artificial teeth that replace the teeth that you’re missing. They fit over your jawbone’s ridge, and when they’re fitted properly, they’ll work nearly as well as real teeth. Sometimes, dentures are hard to wear in the beginning. This is perfectly normal – your gums are shrinking, and you’re not going to adapt to them overnight. That’s why your dentist will usually provide you with a temporary set of dentures that will help you to get over the transition period. They’ll look good, and even though they may not feel exactly right, you’ll be able to get used to the feel of dentures in your mouth. Your permanent dentures will fit and feel much better. 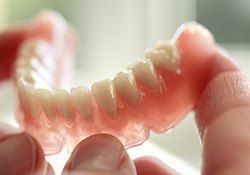 You may need a couple of visits at Atrium Family Dental to make sure that your dentures fit properly, but once they are fitted, you’ll find that they’ll perform nearly as well as natural teeth. You’ll be able to smile again and throw away your blender! Up till now, we’ve talked about ordinary dentures. 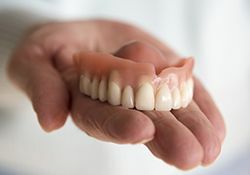 Other types of dentures can be created to work in conjunction with other options. As an example, if you’re thinking about implants, implant-retained dentures can be an option. These are a great alternative to bridgework for people who are only missing a few teeth. They’re fitted on your remaining teeth and anchored by means of implants. 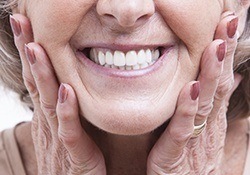 The benefit to this type of denture is that it feels much more secure and natural. Don’t discount a bridge or partial denture either. The benefit to this type of denture is that it’s not all that expensive and it will fill in the gaps where your teeth are missing. It’s a good solution if your teeth are failing and you’re anticipating that you’ll need full dentures or implants. When you come to see us to have dentures created, we’ll take a mold of your teeth and send it off to the lab that will build your dentures. Then, once they’re made, we’ll fit them and re-line them to compensate for the shrinking in your gums. A good denture will always fit properly and work nearly as well as your natural teeth.